I LOVE ceramics & this lesson is ADORABLE! Lily pad & Lotus Flower Ceramics Lesson is targeted for elementary (2nd-5th grade) and teaches both slab & pinch pot techniques. You could adapted this to slightly older students by adding more detail & petals to the flower (4-6th). 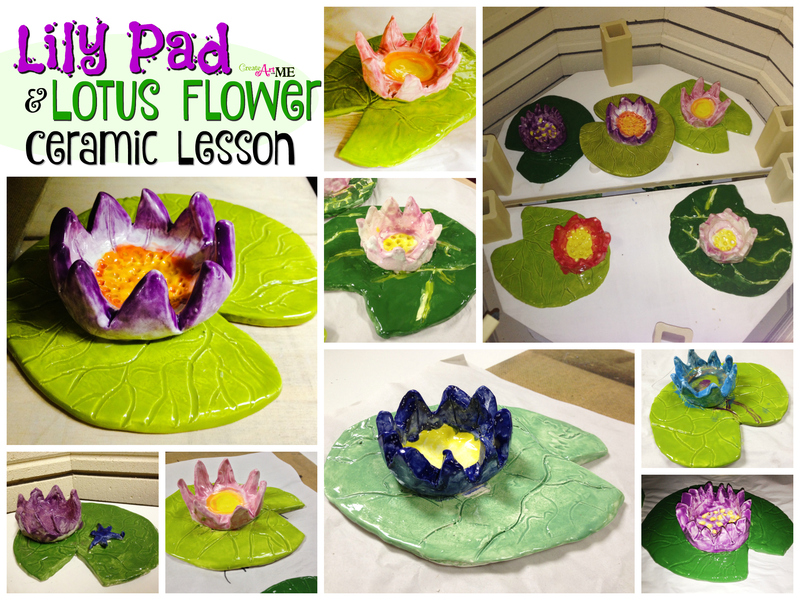 FULL credit for this lesson goes to Artventurous’s Clay Lilypads, please check out Artventurous-there are LOTS of great art ideas for the elementary classroom!! My third grade class did it similarly with one exception-we attached our flower to the lily pad. 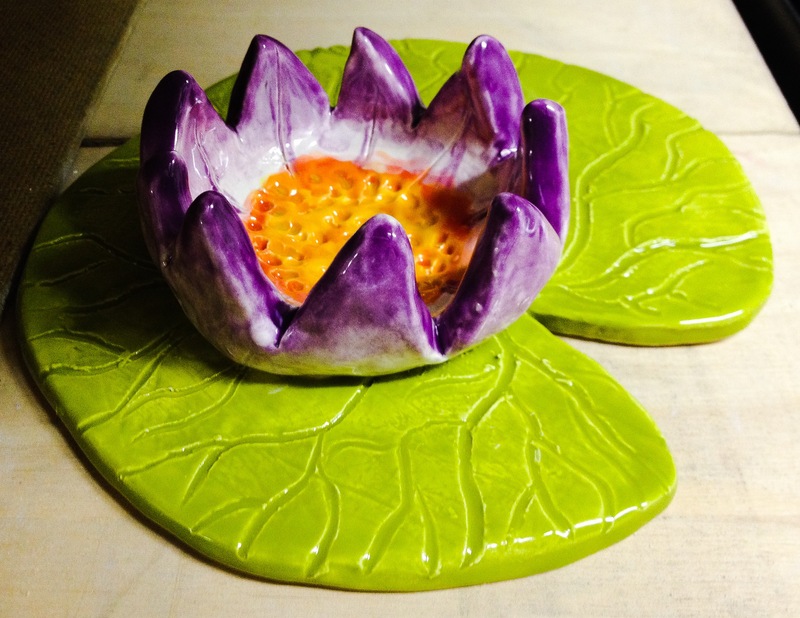 This made glazing a little more difficult, but the flower stays on the lilypad. Here is my lesson plan for this project- again if you use this please give credit to Artventurous’s Clay Lilypads. Shapes are 2D & Forms are 3D. Sculptures are 3D forms. They have height, width and depth. Relief sculptures can only be viewed from the front &sides. Freestanding sculpture or Sculptures in the Round have empty space all around them. Freestanding sculptures can usually be seen all the way around them. View artwork examples of 3D ceramic sculptures & reference pictures for the sculpture we will create. Score and Slip Technique: Teacher DEMO Score and slip refers to a method of joining two pieces of clay together. First, score the clay; this means that you make scratches in the surfaces that will be sticking together. Then you slip it; that is you wet the surface with some slip, using it like glue. Next, you press the two pieces together. It is very important to always score and slip If you do not, the pieces will likely pop apart when they are fired. 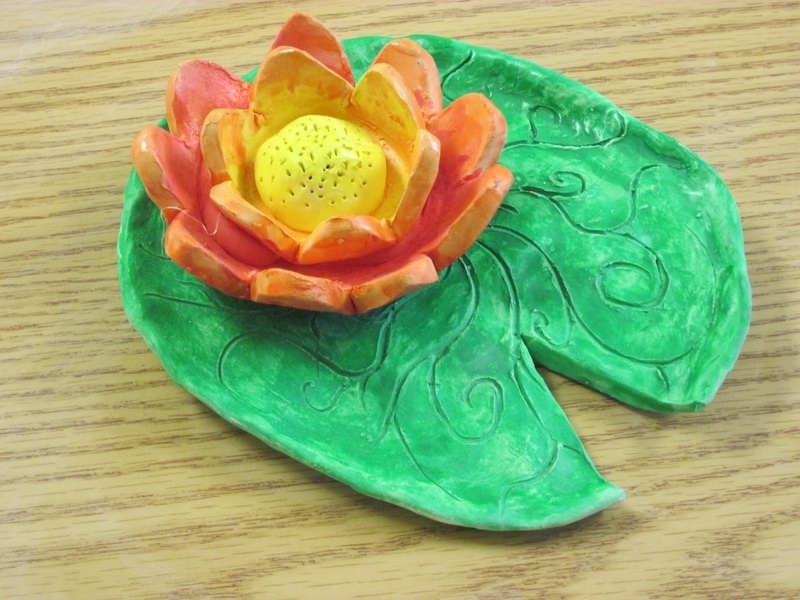 –Use clay to create a lily pad & flower bowl sculpture. 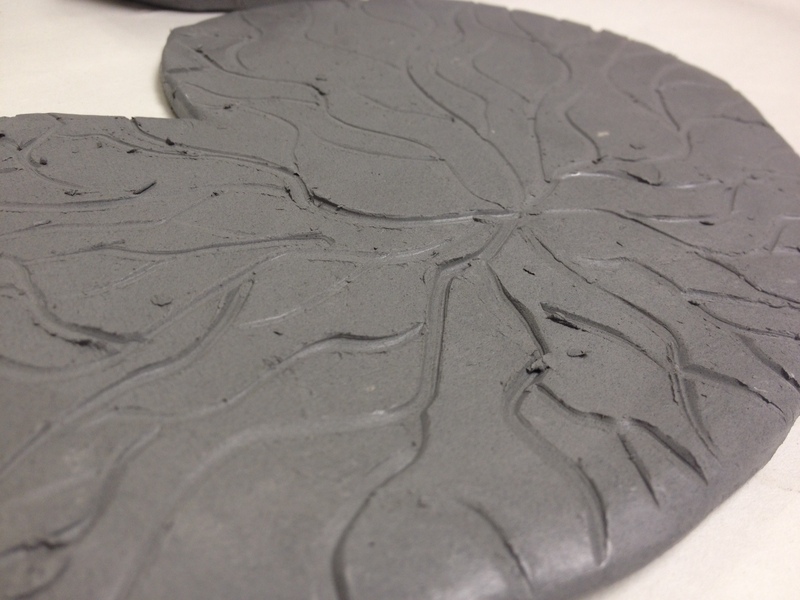 Create the lily pad by rolling out a ball of clay (size of a baseball) into a slab about 6” in diameter. Used ¼” wooden paint sticks on either side of the clay to ensure the clay when rolled out is not too thin or too thick. Optional: Use a cardboard lily pad template to trace and trim out their leaf shaped piece. Use wooden skewers or the end of a paintbrush to carve in the details of the veins, be careful not to press too deep into the slab. Teacher Guided Demo: The teacher will demonstrate the process of rolling out the clay, tracing the circle template, cutting out the “V”, then adding the texture. Give each student a ball of clay about 1.5” in diameter. 3. Flatten out the bottom of the bowl so a tea candle would sit on it properly. 4. Use the needle tool to cut the petals- use a “V” shape. Drape the slab over a very small bowl or Styrofoam ball to create a curved flower form. Using different tools around the classroom they added details to the center of the flower. Let the pieces dry 5-7 days until bone dry. If you choose to use any part of this lesson (written, graphic or photo), please link back to Create Art with ME!